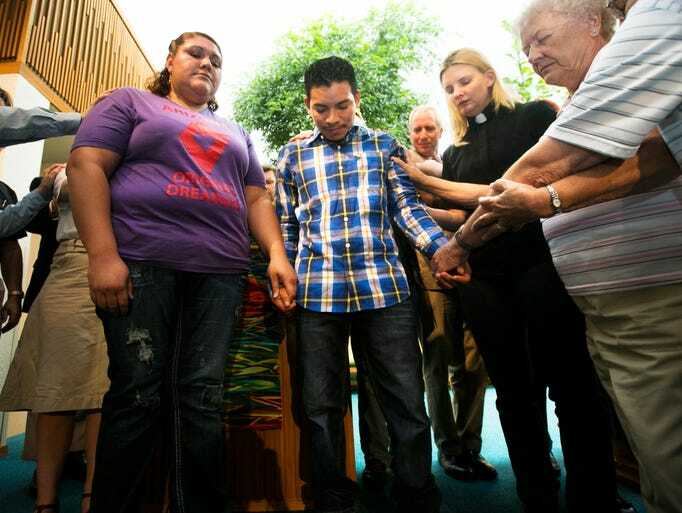 Return Of The Sanctuary Movement: "Guatemalan Man Seeks Asylum In Tempe Church "
The Sanctuary Movement has returned to the United States. For those who forgot, the first Sanctuary Movement was in support of communists from the FMLN who fled El Salvador as the democratic government there thwarted a communist take-over and began the long process of winning the counter-insurgency war in that Central American country. Now, however, the political movement that grew out of the communist terrorist insurgency has won recent elections and is implementing socialist policies. In the medieval period, perhaps there was a need for a sanctuary movement, as the King's justice or that of the local aristocrat was less than what it claimed, but in a modern representative republic with democratic institutions is based on consent of the governed it is an affront. Of course, illegal aliens are not part of the commonweal who should benefit from sanctuary in the event of manifest injustice, but what they are avoiding is not the sharp blade of the King's executioner but mere return to their own country, which, if they had a green card, they would visit regularly. So, the sanctuary movement is really not about justice or lack there of, but a sham based on shameless baby waving for the credulous press. A Guatemalan man took refuge in a Tempe church Thursday morning in an effort to avoid deportation, joining two other undocumented immigrants who have gone to houses of worship in Arizona in recent months seeking asylum from Immigration and Customs Enforcement agents. It's been seven years since Luis Lopez-Acabal illegally immigrated to the United States from Guatemala as a 16-year-old. He stood Thursday in the sanctuary of a Tempe church with his family and the Rev. Eric Ledermann, who said Lopez-Acabal has asked ICE for a reprieve from deportation two times since he was involved in a traffic incident and was denied both times. For incident, read arrest after a stop for a vehicular violation. And the usual suspects are dying mainline Protestant churches and their lesbian ministers without much of congregations to speak of, so they are left trying to poach low IQ Central Americans from the local Hispanicized Catholic Church. Despite being here since age 16, he has been unable to learn English. "I am afraid immigration is going to go to my house," Lopez-Acabal said through an interpreter. "I believe that here I'm going to be able to actually stay with my family. I have two children and I want to stay with them here in the U.S."
A local ICE spokeswoman said Thursday that ICE "has not taken Mr. Lopez into custody and has no plans to do so at this time." And in other cases it has granted reprieve to others who ostentatiously claim "sanctuary" at churches. Lopez-Acabal is the third person in Arizona to seek sanctuary in a church this summer. Marco Tulio Coss Ponce reached an agreement with federal officials hours before he planned to take sanctuary in a Phoenix church in June. In May, a Mexican man violated an order to leave the U.S. by taking sanctuary in a Tucson church. Federal officials have since granted him a one-year stay. It appears ICE ERO is playing a game where Americans and the rule of law are the losers and the winners are illegal aliens who are rewarded for public defiance of immigration law. Some Scriptural advice for Christians who don't like immigration law: And He said to them: Render therefore to Caesar the things that are Caesar' s: and to God the things that are God's.